That he failed to make the top 60 in the world who qualified automatically for Merion following the BMW PGA Championship is an indication that he still has work to do to reach the very top but his unbridled determination to join the world’s elite bodes well for a summer of top class golf from the Clara man. The Offaly star needed a top three finish at Wenworth to earn his second US Open appearance without having to go through today’s 36-hole qualifier, but by taking seven at the par-five 17th he eventually finished four shots behind 20-year old Matteo Manassero in 12th. That meant a rise of just two spots to 77th in the latest world rankings for Lowry, who is already exempt for the Open and the US PGA. “I’m very disappointed as I hung in there all day but that bad tee shot at 17 cost me a good few spots but then that’s golf,” he told reporters afterwards. Lowry birdied the last but for a closing 72 but having hauled himself to within three shots of clubhouse leader Simon Khan with two holes to play, his disappointing was palpable. “It would be a great feeling going to the Memorial knowing I am also into the US Open but we’ll just to wait and see what happens,” added Lowry, who has received a invitation to tee it up in Jack Nickalus’s tournament on the PGA Tour this week. Rather than heading to the US with his homework done, Lowry will join Gareth Maybin and Peter Lawrie in a 96-man field Walton Heath needing a top 10 finish to qualify for the season’s second major. In becoming the youngest BMW PGA champion by beating Simon Khan with a birdie at the fourth play-off hole after Scotland’s Marc Warren was eliminated on their first visit to the 18th, Manassero overtook Graeme McDowell at the top of the Race to Dubai standings. Michael Hoey. Picture Stuart Adams www.golftourimages.com: 24th May 2013 www.golffile.ieThe Italian jumped 19 spots to 28th in the world with Tiger Woods extending his lead at the top over Rory McIlroy to 3.373 from 3.3053 last week following the Holywood star’s missed cut at Wentworth. McDowell remained at seventh with Colonial winner Boo Weekley up 66 places to 55th and also into the US Open. Padraig Harrington, who will not be joining Lowry or McIlroy at Muirfield Village this week, fell three places to 69th in the world after opting to rest rather than travel to Wentworth following a run of three events in a row. The Dubliner is 47th in the Race to Dubai standings, less than €200 ahead of 48th ranked Lowry with McIlroy, last year’s leading money winner on both sides of the Atlantic, back in 68th. 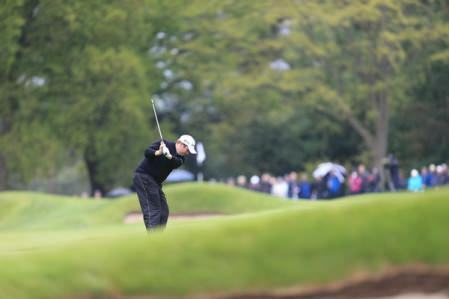 Peter Lawrie is the next best Irishman both in the Race to Dubai (78th) and the world rankings (175th) following his share of 57th at Wentworth where he followed a 74 to three successive 72s. Darren Clarke moved up four places to 296th after thanks to his share of 32nd in the BMW PGA, which was only his fifth appearance of the season that has brought injury problems. Damien McGrane actually fell one place to 108th in the Race to Dubai as a closing 74 left him tied 59th on three over. More worrying is the form of Michael Hoey, whose exemption for winning last season’s Trophée Hassan II runs out at the end of this year. The Belfast man has missed six of his last seven cuts and lies 131st in the Race to Dubai, €28,797 outside the top 110 who will retain their cards. Ballyclare’s Gareth Maybin is also in the danger zone at 123rd in the money list having made just one of his last nine cuts. 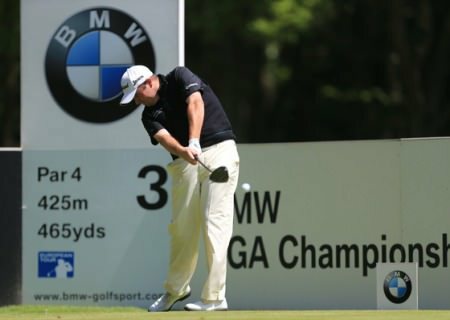 Like a giant cradling an infant, Shane Lowry displayed the gentlest of touches around the greens at the famed Burma Road and coaxed himself into a share of the lead with Denmark’s Thomas Bjorn in the BMW PGA Championship at Wentworth. Darren Clarke is just five shots off the lead in the BMW PGA Championship. Credit: www.golffile.ieQuestions will be answered at Wentworth over the next two days. Is Darren Clarke - five behind leaders Luke Donald, Matteo Manassero and Álvaro Quirós after a closing bogey six for a 72 - really as “rejuvenated” as the commentators would have us believe? Can Rory McIlroy produce a Quail Hollow style weekend and keep his composure long enough to come from 10 strokes off the pace to win the BMW PGA Championship? Shane Lowry admires a rescue at Wentworth on Saturday. Credit: www.golffile.ieGraeme McDowell often jokes that if he can sneak along in Rory McIlroy’s slipstream for a few years, he’ll pick up his fair share of wins and do quite nicely. But Shane Lowry might be thinking along the same lines.